Scorpion, the hell-spawned specter, inexorably seeking vengeance against those responsible for the destruction of his clan and the death of his own family, is one of the game's most popular characters. To ensure a game-accurate likeness, correct to the finest detail, Mezco's award-winning design team has digitally sculpted the figures using the digital files from the game developers themselves. Mezco's 6-inch scale version features 23 points of articulation, many with ball joints, allowing him to recreate all the moves and poses that have made him part of gaming legend. Of course all ninjas need weapons, and Scorpion has them. He comes complete with his spear tipped wrist chains, as well as 2 game-accurate swords. He also has an additional pair of fighting hands for even more game accurate poses. Sub-Zero: This icy assassin is one of the most cold-blooded of all Mortal Kombat characters, and just like each of the three figures in Mezco's initial wave, is one of the few to be a playable character in every version of the game. Of course Sub-Zero needs the weapons he is famous for, so he comes complete with his game-accurate hammer and sword. Raiden, the eternal God of Thunder, is arguably one of the most powerful characters in all of Mortal Kombat, and just like each of the three figures in Mezco's initial wave, is one of the few to be a playable character in every version of the game. As befits an Elder God, Mezco's 6-inch scale version features 23 points of articulation, many with ball joints, allowing him to recreate all the moves and poses that have made him part of gaming legend. Of course even a God of Thunder needs weapons, and Raiden has them. He comes complete with game-accurate alternate hands, alternate lightning hands, and a lightening ball. Each figures comes in its own collector friendly blister card perfect for display. 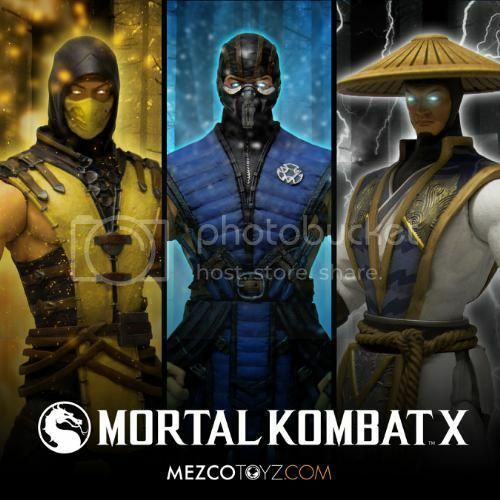 Mortal Kombat X figures from Mezco begin the ultimate battle in stores starting June, 2015. This all looks pretty cool! But based on the image only, i wish Raiden gets more detailed.